In its recent infographic, GOOD magazine looks at “handful of cities around the world and how often their pedestrians are killed while attempting to traverse” some of the world’s biggest urban landscapes. However, the graphic fails to take into account cities in developing countries where the most fatalities occur. Road traffic deaths are projected to be the fifth leading cause of death by 2030. 1.2 million people a year are killed on the road. The U.N. has also called 2011-2020 the “Decade of Road Safety.” EMBARQ, the producer of this blog, has been working to promote walkability and improve public health in the developing world through a grant from Bloomberg Philanthropies. According to Ben Welle, assistant project manager for health and road safety at EMBARQ, the organization has been developing studies to create places and streets for all users of the road, not just people behind the wheel. GOOD’s graphic shows Atlanta as the deadliest major city profiled. The city has about 11 deaths per 100,000 residents. New York City’s rate is about the same as Portland and Copenhagen, with 3.49 and 3.39 deaths, respectively. Hong Kong, Tokyo, Berlin and Stockholm were the most pedestrian-friendly cities with deaths per 100,000 ranging 2.1 to 1.23, in that order. 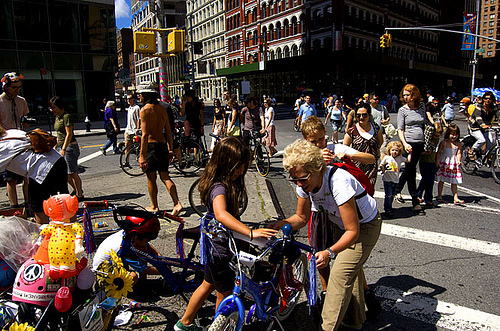 The data came from NYC’s Pedestrian Safety Study and Action Plan [PDF] published last month. The city aims to cut the number of traffic deaths in half by 2030, and the Department of Transportation (DOT) undertook a study to analyze the cost of poor road safety and policies that might make streets safer for pedestrians. However, the city has made remarkable strides in improving pedestrian infrastructure. Traffic fatalities are down 35% since 2001. But still, walkers accounted for 52% of traffic fatalities between 2005-2009.